Digital transformation is no longer optional for industrial companies. The problem is it’s really, really hard. Download this collection free for a limited time. Leading a corporate transformation of any kind is difficult, and it hasn’t become any easier over time. But starting and sustaining a digital transformation in a manufacturing company? That’s tougher than managing any other change initiative — from total quality management to Six Sigma to lean manufacturing — and, believe us, we’ve lived through, or seen, them all over the last three decades. Becoming digital is a requisite for survival today. However, while waves of technology — automation, additive manufacturing, AI — are washing over the corporate world, redefining the nature of work and productivity, there are no playbooks and few best practices for manufacturers’ digital transformation. Few industrial companies even paid attention to digital technologies until recently. Just nine years ago, for instance, General Electric didn’t track them closely, never thought about how they could fit in with the machines it manufactured, and, above all, didn’t realize it could make money from them. Digitalization was far removed from GE’s industrial reality. Even today, although most manufacturers are beginning to flirt with digital technologies, not one has successfully pulled off a digital transformation. CEOs still have to figure out its art — and science — forcing them to draw up their game plans on the fly, which inevitably leads to tension and trauma. Some business leaders have been criticized for kicking off digital transformations prematurely; others for delaying them; and still others have been sacked for not sustaining them. One of us spearheaded several transformations between 2001 and 2017 — including a digital transformation — at GE, a well-established global corporation. The other has been studying innovation and change in large companies, including GE, for decades. 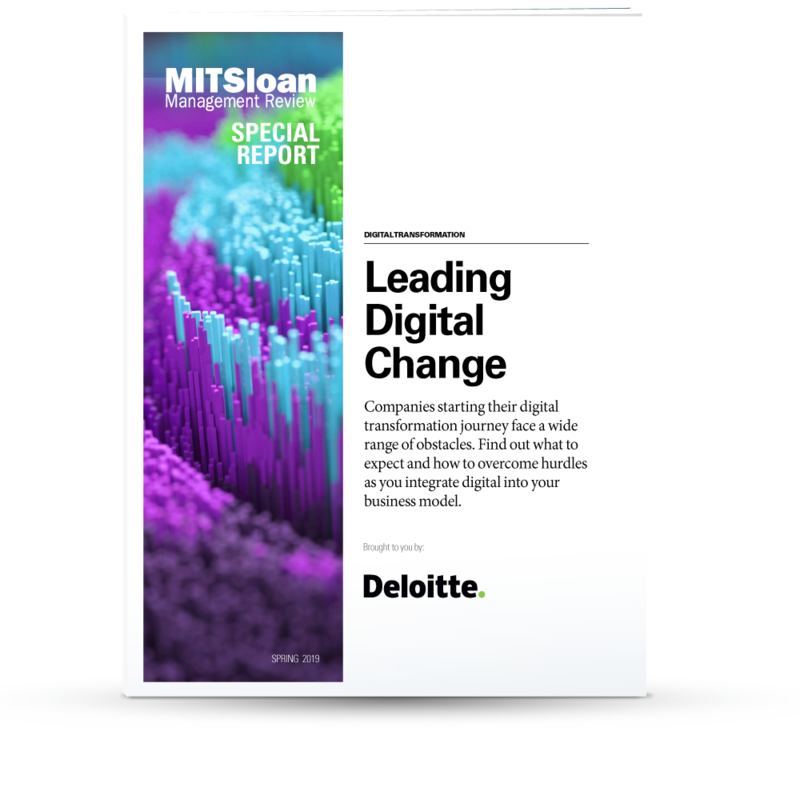 We’re both convinced that executing a digital transformation is not only the most complex but also the most critical challenge that any manufacturer faces today. That’s why we came together to coauthor this article, which illuminates why digital transformation is so tough for manufacturers and shares some key learnings from our experience. GE was probably the first manufacturer to internalize that digital technologies could disrupt its businesses. Vijay Govindarajan (@vgovindarajan) is the Coxe Distinguished Professor at Dartmouth College’s Tuck School of Business. He was the first professor-in-residence and chief innovation consultant at General Electric. Jeffrey R. Immelt (@jeffimmelt) was GE’s chairperson and CEO for 16 years. He is currently the chairperson of Athenahealth, a partner of the venture capital firm New Enterprise Associates, and a board member of Desktop Metal, a 3-D printing startup. 1. The insights and data in this article come from the authors’ direct experience working with GE for many years. 2. “Digital Transformation of Industries: Digital Enterprise,” white paper, World Economic Forum and Accenture, New York, January 2016; and W. Ruh, keynote presentation (Minds + Machines 2016 conference, San Francisco, Nov. 15-16, 2016). The $6.8 trillion figure is based on the World Economic Forum white paper, but was extrapolated to represent the amount that only applied to GE’s then-businesses. 3. V. Govindarajan, The Three-Box Solution: A Strategy for Leading Innovation (Boston: Harvard Business Review Press, 2016). A blockchain platform for the energy sector could accelerate the transition to renewables. New research finds that investments companies make in information technology increase profitability and sales more than investments in advertising or R&D do. An excellent article arguing the case for the servitization of the manufacturing sector and showing that for it digital transformation is a critical factor. I wonder why the authors in the article did not at all use the term servitization. Is this applicable to small industries? IoT and other initiatives are not new anymore, technology is cheap, but culture and processes are extremely difficult to go through. This is one of the best articles I’ve read that comprehensively speaks to the realities of digital transformation. I would add to the authors that this same case study is not limited to manufacturing, it extends to just about every industry. I’ve been designing digital products for the past 25 years across several industries: Retail, pharma, technology, financial services, insurance and I can attest that the same scenarios affect all industries in one way or another. The blood bath hasn’t even began. In GEAE under Jack Welch era. GE aviation launched the GE90 engine program in 1989s. In order to satisfy the FAA ETOPS program certification requirements, GE, Boeing, Airlines, were required to ready for the advanced digital system such ACARS, FMS, FADEC, dual channel system, remote monitoring and control capacities throughout the program participants, Snecma, Fait, IHI. The engine test big data in IHI, Snecma were available in GEAE Evendale. On July 20, 1997. One ETOPS demonstrator 777 CZ piloted by China Southern airline Captain Yang and crews flew across the pacific ocean making six historical records of aviation from GGG to LAX. FAA awarded the 777 with 120 minutes operation certificates. All digital monitoring at the Delta Airline flight Control Center, Boeing flight control center, LAX United airlines, GEAE. and China Southern. This was the most advanced digital program experiences were later leveraged to all other GE store of GE products, transportation, locomotives, oil, gas, wind turbines, healthcare, water etc. in GE Digital early digital transformation history. GEAE is leading and very proud of the digital team spreading and seeding from the FADEC monitoring team and contributors from the digital programs.